Thematic collecting is now one of the most popular ways of collecting stamps. Instead of collecting (say) British stamps or Australian stamps, why not collect stamps with a particular theme of your own choice from anywhere in the world? And if you are a collector of railway stamps, why not pick some aspect of railways and collect any and all stamps which fit into your theme – wherever they come from? Everyone must have played with toy trains. You did (didn’t you?). As soon as the railways were invented, toy manufactures began to produce model engines and trains. Parents bought them for their children. 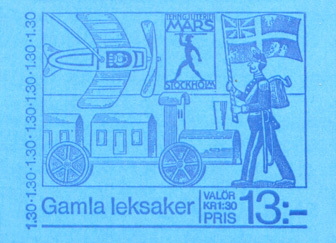 Here we have a collage consisting of a toy train (a wooden model), a toy aeroplane and a toy soldier on the cover of a Swedish stamp booklet. 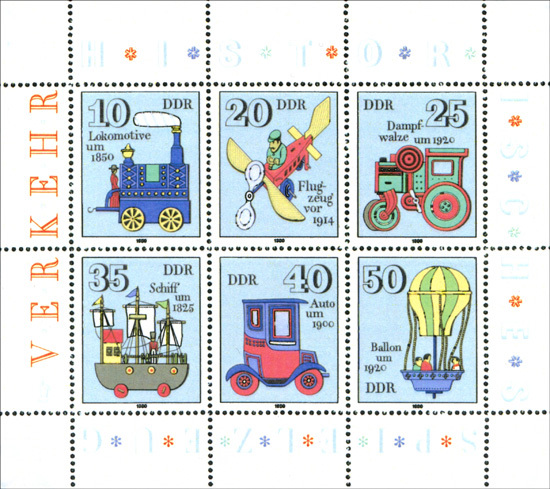 Here is a sheet of German stamps illustrating various toys. The toy train (top left stamp) is a tin-plate model. There are stamps with pictures of toy trains for babies (imprinted on a piece of postal stationery from Czechoslovakia), stamps from Korea showing toy trains for youngsters, and stamps from Russia with pictures of modellers playing with toy trains, boats and planes. The final item in this most attractive display is a stamp booklet cover from Germany showing a model train set made by MÄRKLIN, the German company (founded in 1859) which was famous for making all kinds of toy and model trains and railway layouts. So why not choose your own railway related topic and start collecting items to illustrate it. Take your time … do it piecemeal. There is no hurry, and it can be most rewarding!